You can only miss the many prayer houses out of town if you go out with your eyes closed. Some of the more well disposed Hindu families even have small temples built on their own grounds, as did Lila’s (see later) parents in Commewijne. Something you can recognize Hindi households by is the many flags in one corner of their yard. After a service is held in their homes, a flag is erected in their yard where the length of the pole refers to the importance of the god that was honored. Close to ‘Op weg naar zee’, where we saw the cremation of three Hindus, there’s also a pilgrimage site. 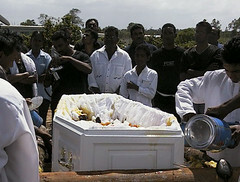 Similar to what happens in the Ganges once a year, Hindus come here to cleanse themselves. 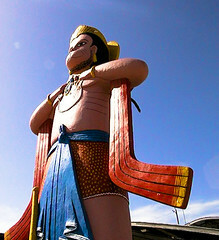 A large statue of Hanuman, resembling an ice hockey player, guards the entrance.